A perfectly raked oval track framed the Detroit Race Course as it awaited its 1999 demolition. 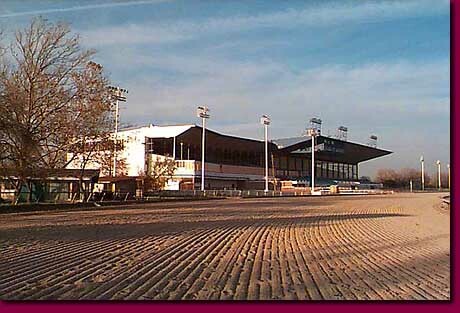 The end of major league baseball at Tiger Stadium overshadowed the end of thoroughbred racing at the Detroit Race Course in the suburb of Livonia. The last races were run in 1998 and it continued to operate as a video racing venue into 1999. It was demolished in the summer of 1999 and is now the site of a rising industrial complex.